Rev. Sunggook Ahn was there when Sungman Jung, the 73-year-old owner of a Bronx candy store, died at Calvary Hospital on Nov. 26. “We are all weak culturally and spiritually, because there are not a lot of people like us here in the Bronx, but I want to be the porcelain that binds the little pieces together." Jung’s wife, Youngeun, made somewhat of a shrieking sound of sobbing as her husband took his last breaths. The lament has a special name in Korean, aedo, a traditional way of crying as an outward expression of agony for the dying and the dead. The nurses and doctors at the Bronx hospital seemed to grow impatient with the vocally sobbing widow, though Calvary Hospital specializes in caring for advance-staged cancer patients. Ahn stepped away after finishing his last prayer and shut the door, allowing the widowed woman to continue to weep. “The Blessed Land” was one of Ahn’s frequently chosen hymns to sing to families that are watching a loved one at the end of life, hoping to send the deceased to heaven through at least a momentary acceptance of Jesus Christ as their savior. “They’ve lived a difficult life throughout their lives in the Bronx,” Ahn told NBC News, adding that most families who came to New York in the late 1980s and early 1990s chose the Bronx as an easy location to initially settle down in, before saving up to move to other boroughs, such as Manhattan, Queens, or cities in New Jersey. It was a constant struggle for first-generation Koreans to find and maintain their cultural identity, particularly with language barriers and traditional differences, Ahn said — and he would know: he was one of them. Ahn came to New York in 1991 with his wife, a one-year-old son, and a six-year-old daughter in search of a greater ocean of opportunities to serve and spread the word of God. But to his dismay, he found America to be completely different from the land of abundance and spirit that he expected. “Everyone was very independent, nobody trusted each other, which is why I had to bring back a community spirit that I’m sure all the Korean senior citizens in the Bronx are very well aware of," Ahn said. That sense of community is one Ahn is familiar with: he had suffered severe kidney failure eight years ago, and had prayed for a miracle for a donor to come along. The doctors told him that he would not live, but his fellow pastors back in Korea helped him find a match in China. His kidney transplant was a success. Even after what he calls a miraculous kidney transplant surgery, Ahn has to rely on a handful of pills after every meal, as part of immunosuppressants that will suppress his immune system to keep his body from rejecting. Since his surgery, he’s gained more than 150 pounds and now suffers another health problem: severe obesity and high blood pressure. Ahn currently leads Neung Lyuk Church—meaning "ability" in Korean—a Presbyterian church of Koreans in their 70s, 80s, and even some in their 90s, located in Yonkers, New York. “I am blessed with the ability to bring the scattered Korean souls to their roots, to let them know that they are not in their last years alone,” he said. Ahn explained that what makes his church members most happy is when he talks about the embarrassing romantic encounters he had as a child because it brings about a wave of nostalgia in the air for the sermon, and reminds the members what it was like to be in a marriage. He wishes to help gather the lonely souls and help them find their place in the community that will eventually lead to finding their place in heaven as well. 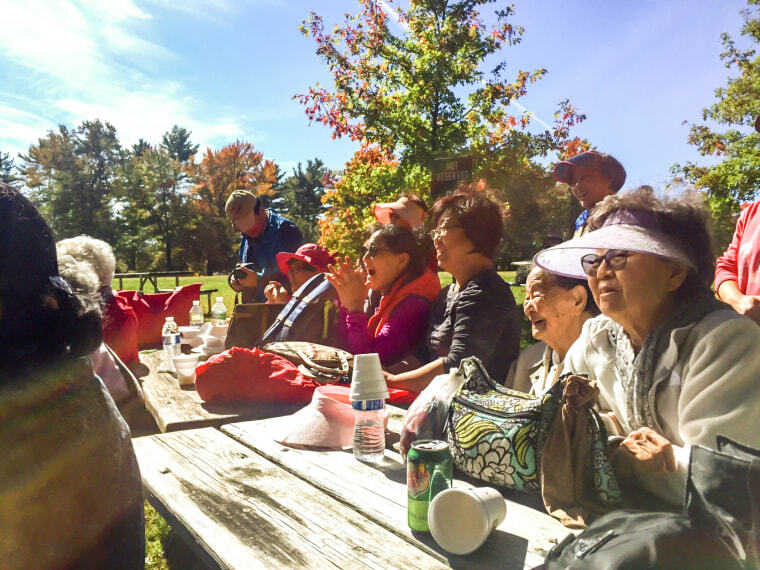 After a Bible study meeting at the church on a recent December morning service, the topic of death came up almost casually among a group of Korean women in their late 70s. “I heard Reverend Ahn sang to Mr. Jung as his soul was taken back to his creator. Rev. Ahn sang to my husband too,” said Jungja Lim, 79, who used to run a floral shop near the New York Botanical Garden. After her husband passed away, Lim didn’t have to worry about arranging a Korean traditional funeral in the Bronx. Ahn managed to bring sobok, white mourning garments, for Lim to wear as she wept her last farewell to her partner of more than 60 years. The group of Korean ladies had all visited Calvary Hospital to console Jung's grieving widow and children after he passed. The support they had for each other was silent but firm—just like the community’s existence in the Bronx. “We are all weak culturally and spiritually, because there are not a lot of people like us here in the Bronx, but I want to be the porcelain that binds the little pieces together,” Ahn said.